Although there was no lack of cars or engines, Formula Atlantic started slowly due to uncertainty over whether the new formula could succeed between F2 and F3. Formula Ford and F3 cars supplemented the grid at the first race and most of the cars this season were converted F2, F3 or even Formula Ford cars. 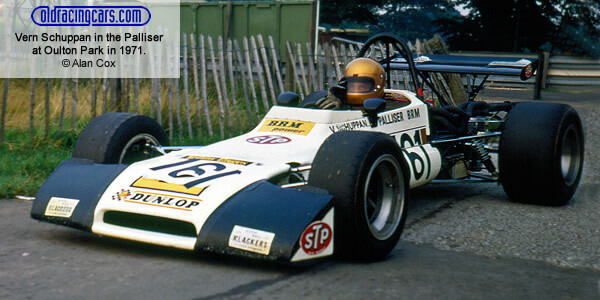 Yellow Pages sponsored the inaugural season and the championship became a battle between Vern Schuppan in the works Palliser and Cyd Williams in Graham Eden's Chevron B18C. Schuppan put together a string of first and second places and almost had the title in his pocket by September. Williams then won three on the trot but was too late the catch the Australian. Clive Santo and John Gillmeister also ran Pallisers but achieved little; with sales dwindling despite Schuppan's title victory, Palliser Racing Design folded early in 1972. Brabhams were predictably the most numerous on the Atlantic grids and would have won any constructors title from Palliser, Chevron, March, Lotus and Royale by sheer weight of numbers. The two non-championship races are also included above, won by Nick Craw (Brabham BT35) and John Nicholson (March 702). Points table top five is from the John Player Motorsport Yearbook 1972, p291, with the remaining places constructed from race results. Not all the results are complete; results sheets or details of non-starters are needed for Castle Combe 12 Apr 1971, Oulton Park 3 Jul 1971, Mallory Park 15 Aug 1971, Castle Combe 30 Aug 1971, Oulton Park 18 Sep 1971 and Silverstone 3 Oct 1971. The only entry lists still needed are for Oulton Park 21 Mar 1971, Silverstone 3 Oct 1971 and Snetterton 10 Oct 1971. Grid sheets or details of qualifying are needed for Oulton Park 21 Mar 1971, Mallory Park 28 Mar 1971, Castle Combe 12 Apr 1971, Brands Hatch 20 Jun 1971, Oulton Park 3 Jul 1971, Brands Hatch 4 Jul 1971, Castle Combe 24 Jul 1971, Mallory Park 15 Aug 1971, Oulton Park 28 Aug 1971, Castle Combe 30 Aug 1971, Brands Hatch 12 Sep 1971, Oulton Park 18 Sep 1971, Silverstone 3 Oct 1971, Snetterton 10 Oct 1971, Mallory Park 24 Oct 1971 and Brands Hatch 27 Dec 1971. Chassis identification is largely from details of previous owners of second-hand cars (typically F2 cars which have been identified from F2 reports), chassis plate observations by Adam Ferrington and others plus constructor production records for Chevron, March, Lotus and Royale. Palliser production records may still exist somewhere and copies would be most welcome. More details of the Kitchiner, Alexis, Huron, Hawke, Dulon and Titan would also be very helpful.